Question: I am working Double Seed Stitch and have worked a decrease for a neckline in the sweater. Need to frog back about a dozen rows. Is there a relatively easy way to do this? I believe I should be able to take a piece of waste yarn or a separate needle to pick up the stitches in a row below where I need to go back to, but am not sure what the stitches will look like as I need to pick them up, still knitted. 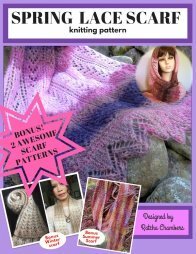 I don't want to pick up the wrong side of the 'v' on the knitted stitches and the 'bump' on the purl stitches and NEVER pick up the wrap as I shifted between a knit and a purl stitch. Thank you for the question. When I have to rip apart my work I usually do it the way you describe - pick up sts with a needle or waste yarn at a row below where I need to go back to. You could try a waste yarn on a tapestry needle. Pick up only the right side of each loop carefully. The needle will go under the right sides of the loops and over the left sides. You'll be moving the needle up and down like the ocean weaves. I know it is going to be a little more challenge than usual but I don't think there is any easier way to do this. If you wanted to pick up sts with a knitting needle, try couple sizes smaller so it is easier to pick up. P.S. 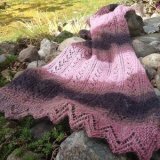 Did you try posting your question on Knittingparadise's Forum? Maybe other knitters will have better ideas than me. It's a great knitting community to ask a question.